The Bicaz Gorge is a gorge in Romania, located in the north-east part of the country. 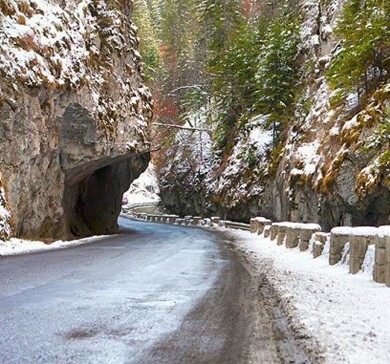 The road that slices through the gorges is among Romania’s most spectacular. This stunning gorge has a part that is so narrow that it is known as "The Neck Of Hell." The drive is definitely worth it. There are many excellent photo opportunities here. Don’t forget your camera! The gorge is part of the Cheile Bicazului-Hășmaș National Park. Along this way, one may find bazaars where one can buy products made by the Romanian and Hungarian craftsmen from this area. The gorge twists and turns steeply uphill for 5km, cutting through sheer, 300m-high limestone rocks. At one point, the narrow mountain road runs uncomfortably beneath the overhanging rocks in a section known as the ‘neck of hell’ (Gâtul Iadului). 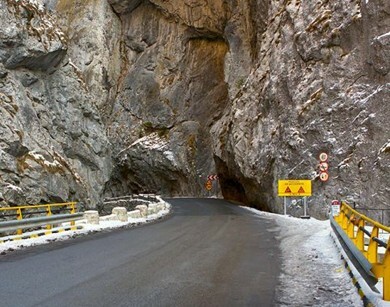 The road through the gorge is called DN12C national road. It’s asphalted and is located in the Eastern Carpathians of Romania. The Bicaz Gorges are without a doubt one of the most breathtaking natural attractions in Romania. The gorge link Transylvania to the historical Romanian region of Moldavia. 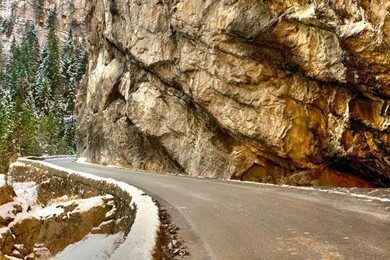 Along this thrilling road that pass thru the mountains the 200m high walls seems to be "closing" on you. The road along the 8 kilometres of ravines, often in serpentines with rock on one side and a sheer drop on the other, is one of the most spectacular drives in the country. The gorge has the local name of Cheile Bicazului . This scenic drive is spectacular with sheer cliffs rising literally from the edges of the road. The road inside this canyon looks like serpentine windings. The limy walls of the crags hide amazing caves (The Black Cave and The Waterfall Cave) and also circular precipices (Licas, the precipice with three entrances). This road is very exciting and sometimes very exposed and unsecured driveway in innumerable twists and turns. This infamous road is tightly hairpinned and bumped, an exquisite winding mountain drive with sharp and blind curves and hairpin switchbacks leading the traveler over the mountains. Legend has it that the ‘red lake’ or ‘killer lake’ was formed from the flowing blood of a group of hapless picnickers who had the misfortune to be sitting beneath the mountainside when it collapsed, crushing them to death.